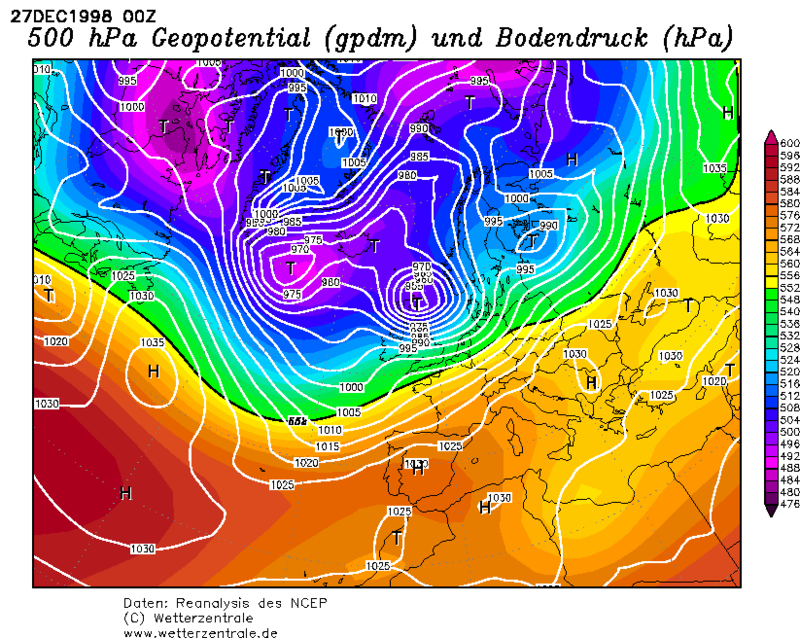 The run up to Christmas 1998 had been very unsettled and the day itself was mild and wet. A low pressure system was moving across the Atlantic and deepening as it moved towards the UK, by midnight on the 27th December, it had deepened to 955mb. Along it's southern flank, winds gusted up to over 100mph, 103mph at Prestwick Airport was recorded. The worst hit areas were northern England and Wales, Northern Ireland, southern and central Scotland, where there was structural damage to buildings, trees uprooted and power failures. 5 people died because of the gales. I remember it being particularly windy that evening. I do remember this, but not as well as the storm of christmas eve 1997, largely because that storm caused a power outage here on christmas day, ruining many a christmas dinner. I don't recall any particular damage or major effect from the 98 storm. I think of christmas 97 and 98 as two couplets both very stormy, wet and mild. 1995 and 96, also two couplets both cold and wintry, along with 00 and 01 - cold and wintry. Christmas 99 was a toned down version of 97 and 98, windy and wet at times but more of a colder NW flow. Compared to christmas 2018 seem a world away, not experienced such a quiet christmas period since 1992.